1. Talk or writing dismissed as nonsensical or inaccurate: The social columnist for the local newspaper wrote a lot of bunkum about the celebrities in the community. 2. Etymology: Bunk is here a shortened form of bunkum, a phonetic spelling of Buncombe, a county in North Carolina. During the extended Missouri statehood debates, on February 25, 1820, N.C. Representative Felix Walker started what promised to be a "long, dull, irrelevant speech", and he resisted calls to cut it short by saying he was bound to say something that could appear in the newspapers in his home district and prove that he was on the job. "I shall not be speaking to the House," he confessed, "but to the people of Buncombe"; however, it soon became a term for "political wind-bagging" and took on the more general meaning of "nonsense" or "claptrap" (insincere and foolish talk). 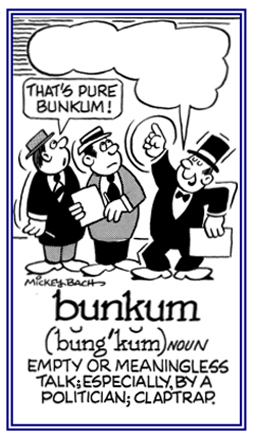 Bunkum has been used in American English as a slang term for "nonsense" since at least 1847 and was popularized by Henry Ford's remark in 1916: "History is more or less bunk." Springfield, Massachusetts; 1989; page 73. New York; 1990; page 86.